ClassicSeries Surface mounted napkin/tampon vendor. Equipped with stainless steel skirt for surface mounting. Push button operation, less than 5lbs of force, no grasping, pinching or twisting of the wrist. Easy access Product tray. Single-coin slots are key to jam-resistant operation. Accepts one or two quarters (U.S. or Canadian). Push-button coin return cancels Product selection. Returned coins or wrong coins (1¢, 5¢,10¢) by-pass mechanism and drop into Product tray. Empty Product indicator automatically blocks coin slot. Easy Product loading, no weights. Holds 30 tampons, 20 napkins. Two flush tumbler door locks keyed like other Bobrick accessories. 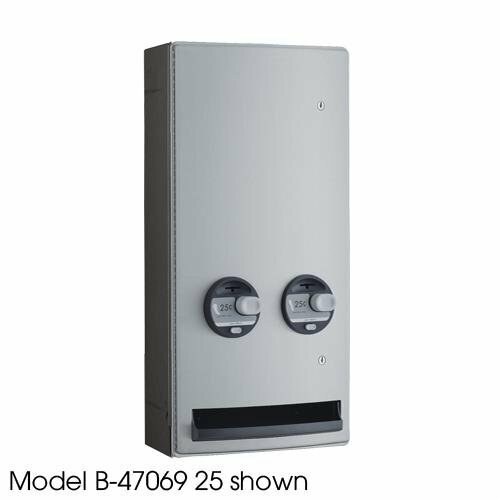 Separately-keyed coin box lock for management access. Easy 25¢ 50¢ field coin conversion. Type 304 satin-finish stainless steel on exposed surfaces. Measures 14-3/8" width by 28-3/8" height.